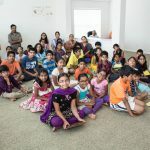 A kid’s retreat program [Gopakuteeram] was conducted in which 30 kids participated with zeal and enthusiasm. The session commenced off with a prayer song and Mahamantra chanting for eleven times. 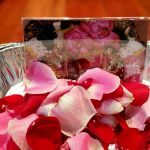 The Gopas and Gopis then recited a sloka from Kunti Stuthi and Sri Ramanujamji explained the meaning of the sloka. There was a brainstorm session about Lord Sri Krishna. 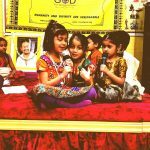 At the end of this session the children learnt that Krishna was always their best friend, He will make everybody strong and keep them always happy. Whenever one is scared, or worried, if we chant His name, He will always be with us. 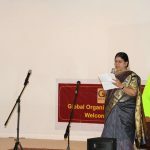 A quiz on Lord Krishna was conducted. Then the Damodara Leela was read out to the kids. Then the kids were divided into three groups and they enacted the same Damodara Leela. 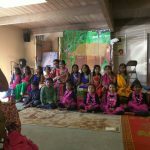 This play was not only enjoyed by the kids but also all the parents and visitors at the temple. They learnt an important virtue that it is always good to be GOOD. As part of the kid’s activity time, the pictures that depict the Damodara Leela were all jumbled. The kids were asked to arrange the pictures in the correct order. 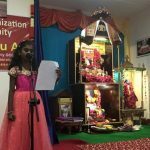 Sri Ramanujamji conducted a quiz program where one kid from each group was told the character to be enacted and the other members of that team were asked to guess that character. The program concluded with Mahamantra and certificates were handed out to all kids who participated.